The unemployment rate is at a 16-year low and today’s job seekers have countless job opportunities at the tips of their fingers, making the hiring market extremely competitive for employers hoping to secure top talent. To build your best team, it’s critical to support a positive job applicant experience – or risk losing quality candidates to the competition, face staff shortages and, as a result, see a decrease in productivity and profitability. Your business should place as much emphasis on creating a strong job applicant experience as you do on creating a great customer experience. A positive applicant experience that includes the following components can help you secure top talent to drive profitability at your business. The job applicant experience starts when prospective applicants begin researching your business to see if any open roles would be a fit for their background, skills and career goals. And a strong employment brand can help you stand out from the competition and attract top candidates, who will ultimately contribute to increased efficiency, productivity and revenue at your business. To build a strong employment brand, highlight the benefits your business has to offer – including vacation time, professional development budget, learning opportunities, and more. Also build out career paths on your career site, so prospective employees can see ways to rise from entry level to management positions. And continuously share engaging content – such as videos, photos and employee testimonials, to get potential applicants excited about the possibility of working for your business. Some business leaders only set aside time once or a few times a week to review new job applicants. But Hireology data has shown that applicants reviewed and acted upon quickly are more likely to be hired. Across Hireology customers using our integrated hiring process, 70 percent of new hires are reviewed within 12 hours of submitting an application. Responding to applicants as soon as possible can help ensure strong candidates stay excited about the the possibility of working for your business. If you leave applicants waiting around for a response, you risk losing qualified candidates to other job opportunities – and even your competitors. In addition to responding to initial applicants quickly, it’s important to regularly communicate with candidates throughout the entire hiring process. If you’re in the process of scheduling interviews and can’t find time in a team member’s schedule for a few days or a week, communicate this to the candidate instead of leaving them hanging until the interview is confirmed. And if it’s taking a while to receive reference or background checks back from a candidate, reach out to check on the status or see if there’s anything you can do to help. Finally, when candidates don’t end up getting an offer, make sure to close the loop by letting them know. This way, if they’re considering a job with your business in the future or know a friend or colleague who would be a great fit for a role, they’ll remember the organized, professional job applicant experience throughout the process and think positively of your business. Since many of your candidates might already have jobs, streamline the interview process to ensure strong candidates don’t need to take significant time out of their schedule throughout the process. Start out with a phone screen before inviting candidates in for an in-person interview. This can be a quick call, saving your team and the candidate time and resources, and can help you weed out candidates who might not be a fit for your company. When scheduling in-person interviews, move the process along as quickly as possible, such as setting up back-to-back interviews with different team members, instead of requiring candidates to come back to your office on several different occasions. A delay in the interview process can lead to candidates getting frustrated or accepting another job offer with a quicker process. The most engaged candidates come to interviews prepared with questions about the role, your team and the company as a whole. Make sure the interview isn’t one-sided by leaving time for the candidate to ask questions at the end. Opening the interview to questions shows candidates you’re truly invested in the success and career goals of your employees. And it also gives your hiring managers the opportunity to learn more about why each candidate wants to join your team. According to a survey from Future Workplace, 78% of job seekers indicate they’ve never been asked for feedback on the candidate experience, and only 25% of employers regularly request feedback from candidates. 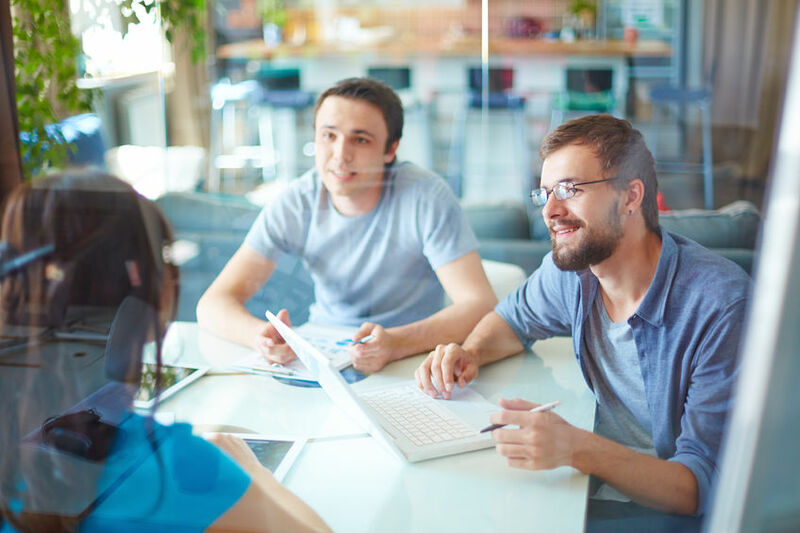 Few businesses collect candidate feedback, but doing so can have vast benefits – including helping your business improve its hiring process and job applicant experience, which can lead to attracting more quality candidates down the road. Another benefit of collecting feedback is, you can build relationships with candidates. Your business can’t hire every great candidate that walks through your door. By asking strong candidates who you couldn’t hire for their opinion on the job applicant experience, this will let the candidate know their opinion is valued – and you can stay in touch for future opportunities down the road. Not only can a poor experience cause you to lose candidates, but it can cause your overall business reputation to take a hit. Job candidates often leave reviews on Glassdoor, Facebook and other channels – and a negative review can drive future candidates – and even customers – away.